The foires de Champagne, between the 12th and 13th centuries, were mainly held around the Saint-Jean au Marché church and in the adjacent streets and squares, each specializing in one or more types of trade, such as second-hand clothes, pepper,poultry, material, salt, etc. On this square the money-changers operated.They were often jews or lombardys (from northern Italy), many of whom had been living in Troyes for generations. On the nearby street called the « Montée-des-Changes », the admirable Hôtel des Angoiselles, built for a family of lombardy bankers, is worth a visit. Merchants from all over Europe brought with them their own currency, but during the fairs, only the currencies of the Counts of Champagne or the King of France were legal tender. the money-changers, equipped with a scale, weighed the pieces, measured their alloy (for precious metal content) and calculated the exchange value. These transactions were taxed and were a big source of revenue for the county. 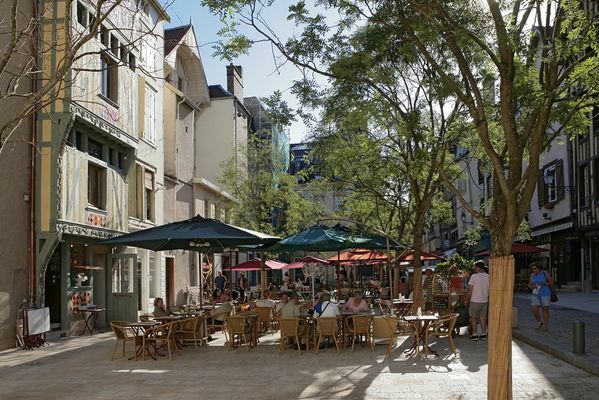 With the decline in the fairs in the 14th century, the square was increasingly taken over by horticulturists and it was then called the place du Marché-aux-Herbes, then, in the 17th century by bakers, hence its current name.